A well made and installed garage door could last you a lifetime with regular maintenance. It is very important to spend some time to think about the best possible choices for your new garage door. Your garage door is also the finishing touch to the exterior decor of your home. It needs to fit in with the style and design of your home as well as being functional and practical. Garage Door Rescue is here to help give you all the information you need before you buy your new garage door. If you would like more information on our garage doors please contact us today! It is extremely important to ensure that your family and pets are safe and secure around your garage door. Accidents can happen, however, it is imperative that we prevent them if we can. It is important for children especially not to touch the garage door. Make sure you test your garage door frequently to ensure everything is working perfectly. If you do think there is a problem with your garage door it is very important to call the experts immediately instead of trying to fix the issue yourself. Usually, the type of garage door you can install into your home will be dictated by the interior and exterior space available. 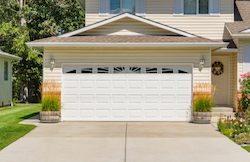 Each garage door opens differently, it is typically advised to allow a meter to safely accommodate the full swing of the door and you when opening it. Please keep in mind also that although the machinery is compact you should still make sure you have space overhead and to the sides of your garage. You will need to allow roughly 40-75 mm clearance on either side of the mechanism. If you would like more information on which garage door would be most space effective don’t hesitate to contact us on our website today. Garages are usually made from one of four materials including; steel, aluminium, wood or steel. Each of these materials has its own advantages and disadvantages so it’s up to you to decide with one is best for you and your garage. Steel is usually the most popular option and does offer the widest range of colour, insulation and price options as well as being very strong and requiring low maintenance. There is a broad range of options when it comes to buying your new garage door, meaning a variation in prices. Your budget will allow you to get different materials, sizes and styles. Garage Door Rescue offer fixed quotes for their services after speaking to their customers to cut out any confusion. 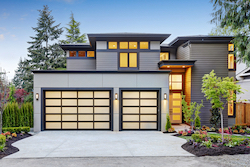 Your home is a place that you are proud of therefore it is important to consider how your new garage door will fit with the style and design of your home. If your home is contemporary a door with clean lines and windows could be a smart choice for you. If you have a classic home a wooden door could be the style that looks the best for you. Some people are keen to give DIY a go and install their garage door themselves, although this is possible it can be quite dangerous. We highly recommend that you get the professionals in for installation, repairs and maintenance to prevent accidents and future problems. Setting up regular maintenance appointments one or twice a year will help to make the most out of your garage door. Maintenance will ensure that problems are solved quickly and efficiently. This will also reduce the risk of accidents and it will also help to reduce costs in the grand scheme of things.